MarEcoTel is a 501 (c)(3) non-profit organization comprised of a small group of biologists whose mission is to support the conservation of marine species and populations by conducting scientific research into their biology, behavior, and physiology for use by managers and stakeholders. We promote the development, improvement, and use of technologies that support our research. Our overarching goal is to improve public knowledge and awareness of these species and the ways that human activities affect them. We are based on the wooded shores of Hood Canal in western Washington state, but our work takes us all over the world. 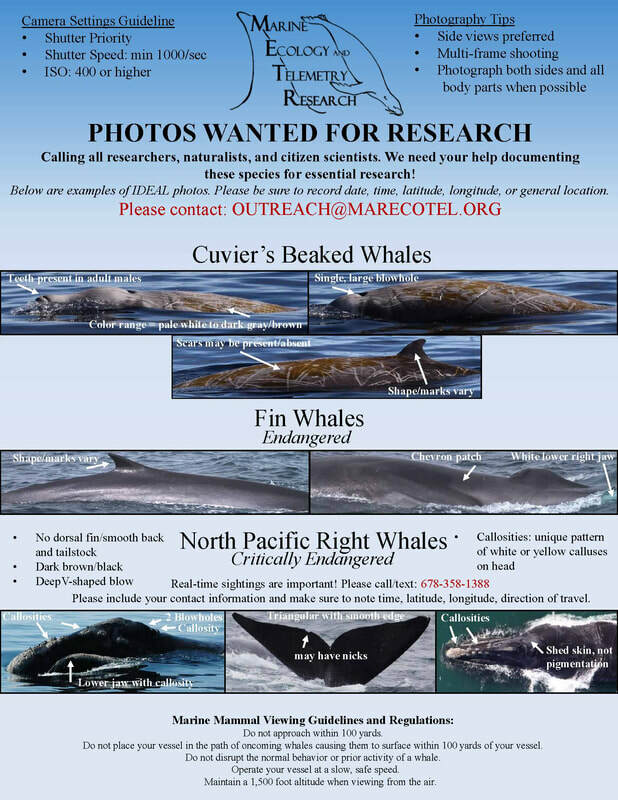 MarEcoTel manages the West Coast fin whale and Cuvier's beaked whale catalogs and is actively involved with North Pacific right whale research. We have created a photo-documentation guide for contributors. Please download, share, and contact us with any questions!